← Last chance for IHBC’s FREE CPD @ London’s Listed Property Show, Olympia, 9/10 Feb: SIGN UP IN ADVANCE for updates on Heritage Statements, Enforcement, ‘At risk’ & Policy developments. 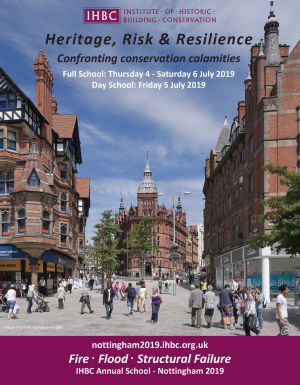 The IHBC has announced two speakers for the ‘flooding’ section of the 2019 Day School ‘Heritage, Risk & Resilience: confronting conservation calamities’ in Nottingham on Friday 5 July: James Innerdale, on sensitive intervention for flood resilience, & Helen Brownlie, on dealing with the after effects of flood particularly in Cockermouth. Booking will open soon and details are available on the School website where you will find more information about the programme, venue and study tours is added regularly. Booking will open soon and details are available at nottingham2019.ihbc.org.uk where you will find that more information about the programme, venues and study tours is added regularly.